Scooper - Technology News: Why don’t employees trust their bosses? Why don’t employees trust their bosses? One in three of us doesn’t trust our employer, according to Edelman Trust Barometer . Edelman’s research has uncovered several interesting trends about workplace trust, which the report argues has significant implications for employers and leaders alike. The report’s authors see this as reflective of “a disconnect between executives and their employees”. The company questioned 33,000 people around the world about trust in the workplace. The findings are displayed in this infographic. Why this lack of trust? There is a disparity, the survey revealed, between areas that employees said were important for trust, and the performance of company leaders in these areas. For example, half of respondents said it was important for the CEO to be ethical, take responsible actions in the wake of a crisis and behave in a transparent way. However, a much lower number of respondents actually felt their CEO was exhibiting these qualities. 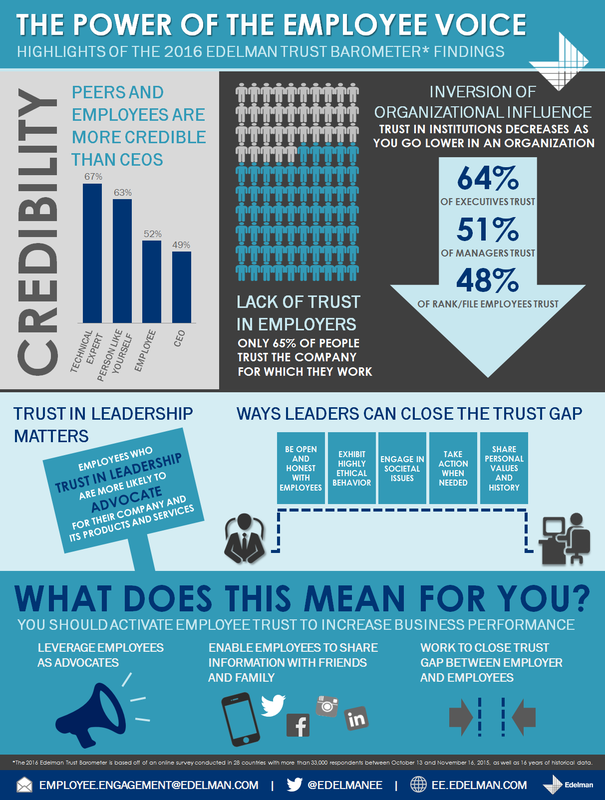 This disparity is in part responsible for trust decreasing as you move down an organization’s hierarchy. So, while two-thirds of executives trust the company, less than half of rank-and-file employees do. Equally, peers were rated as much more credible than CEOs. “Non-trusting employees are far less likely to say good things about their employer,” explains Nick Howard, executive director of Edelman’s employee engagement business in Europe. Employees are the contact point with consumers, and so building trust will help make your employees powerful advocates for your business. To do this, Edelman says, employers and CEOs need to treat their employees well, have ethical practices and be transparent and open. Ensuring employees have trust in the company can have powerful effects on them, their interactions with customers and, ultimately, the customer. Have you read? 4 ways businesses can build customer trust Where do employees trust their companies the most? What's your workplace thinking style?